I wanted to share my Winter Mantel with you today. trying to figure out how I want things to look. my mantel is always a challenge for me. except for the mercury glass hurricanes. on clearance, for only $3.80 each!! How do you like my snowman pillow? Yes, I sewed it myself. but I think he's sweet anyway! I love this photo above. It just screams winter to me. I hope you enjoyed seeing my Winter Mantel today. Wishing you a wonderful, toasty warm day! 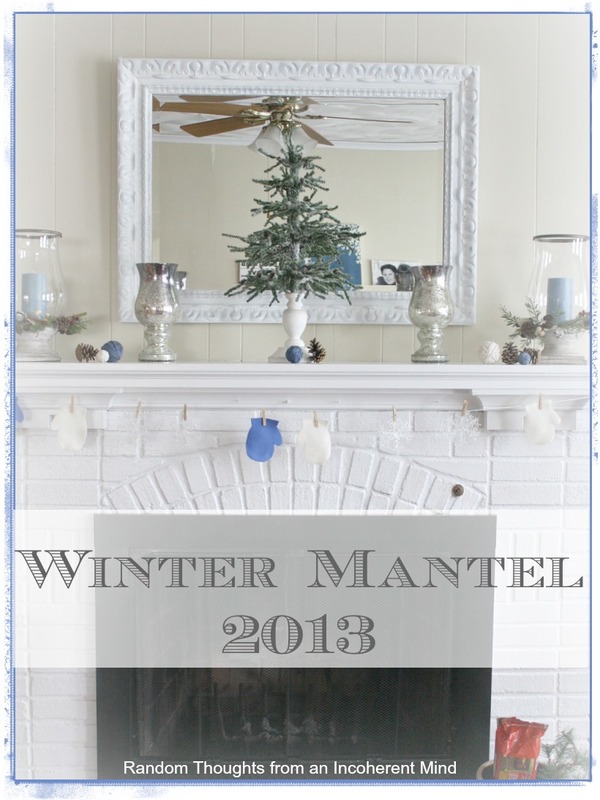 I love your winter mantel. I tend to leave mine the same year round except for Christmas. I also like that tiny tree. It looks real. The blue, silver and white are the perfect winter colors! Great deal on the hurricane lamps Gina, love the pillow too so cute! 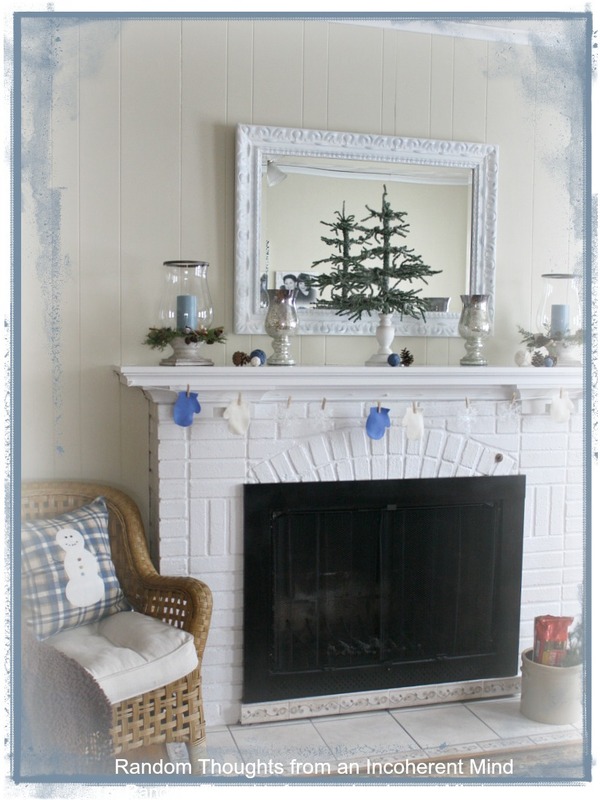 A great winter mantel! So bright and cheery. Love the little balls of yarn. You have a beautiful mantel and fireplace too. Perfect for winter. Love the mittens and the yarn and the colors. It looks absolutely awesome, Gina. It looks wintery, fresh and crisp, love it. Love the blues and the whites!! Oh I think you did a fabulous job-so pretty and yes wintery. Love your winter blues, Gina! Very soothing and calming. Everything looks so pretty! I especially like yout little mitten garland! Hi Gina! Well, honey, if your mantel is a challenge for you no one would know! It's gorgeous! Your snowman looks like the ornaments I made, so of course I love it. Very pretty Gina! 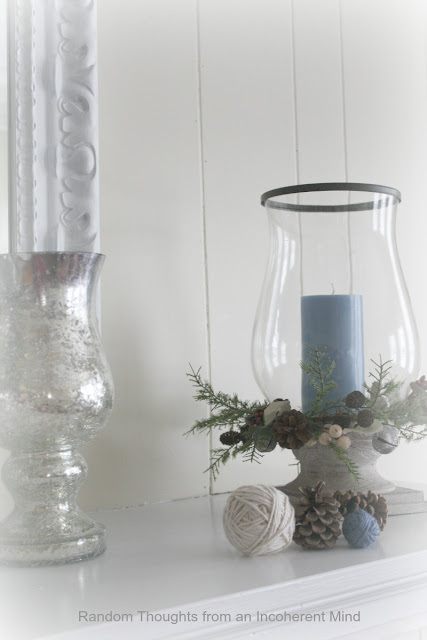 Your mantel is perfect for winter. Great job on that adorable pillow. Very pretty and wintery looking, great combo of colors and finishes. Love, love your mantel. You ought to do a tutorial for your adorable snowman pillow. So cute and very nicely done. OH doggone it I forgot to check the candle holders at Michaels last week when we were there, shoot. Things go so fast too if you don't grab them up quick. Ah well maybe I'll find something I can't live without next time we go to town. I do still have a few mercury glass hurricanes I bought a few years ago. Didn't put them away, keep them out all year so I can rotate them around the house. After holidays seems like I'm stuck in a hole midway somewhere, what do you decorate for? 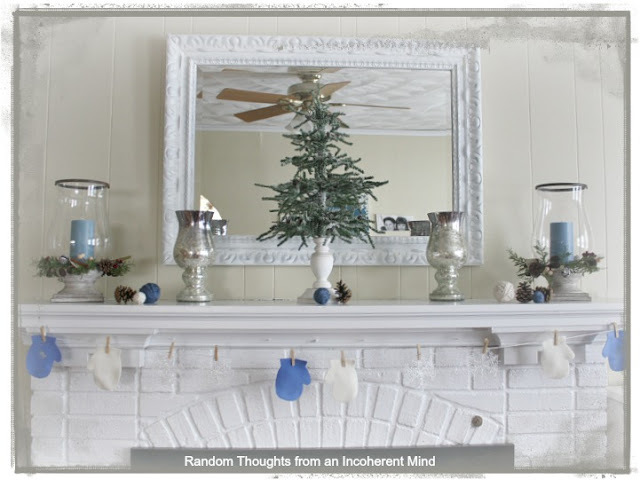 Your wintery mantel gave me ideas, thanks. I love it. Comfy, cozy with a touch of the January blues. My mantel is currently naked. I'm looking for inspiration. Gina my dear blog friend,I am in love,with handsome Mr Snowman,and yes these photo's are screamn' January winter weather,and I hear it loud and proud.I also took down Christmas and missed it so much I found myself wishing I'd left it longer.Now what? ?...the blue is perfect,but I left my red dishes for Valentines,my question is,How to incorporate the red dishes so as not to look like Christmas? I'm going to dollar tree and pick up some "heart" platter's,etc. btw I love those mercury glass,you sure got great buy.Mantel is perfect!! Gina, your mantle looks sooo pretty! Love the pops of blue against the white and your pillow id fabulous! It looks store bought! Very nice! Thank you for sharing! And congrats on the pillow. It's lovely and a nice touch to this "space". Another beautiful mantel Gina! 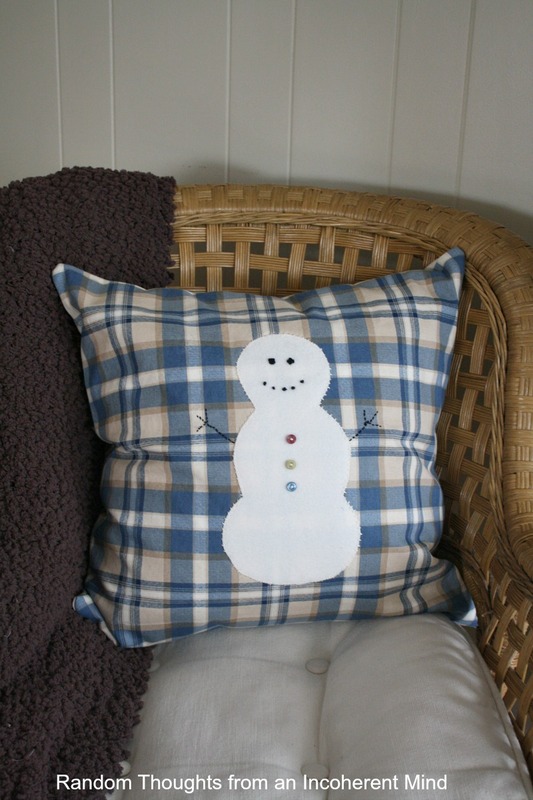 The snowman pillow is adorable! Your a natural at sewing. Love, love LOVE the little garland. I might have to steal that idea from you! I tried..but I could not pick one favorite thing! I like it ALL! My mantle says to ask you to come visit. I like the mitten garland and touches of blue (my fav color!) I so need to "winterize" my mantel...it's quite bare at the moment, thanks for the reminder! Absolutely perfect. Simple but so lovely. Great job. Love the little mitten garland.... great addition! This is breathtaking, dear one!!! I love the blue and white mixed with the silver hurricanes! What a fantastic purchase price!!! I agree your photo of the glass hurricane is stunning!!! I adore your Snowman pillow!!! I have one I bought years ago on an after Christmas $ale at an Antique Shop where there are a lot of Primitives!!! Remember, I'm pretty much a Traditionalist...but this Snowman pillow is one I bring out first...long before Christmas and leave out until the Robin's return in Spring!!! I have a feeling that may be how you feel about your Snowman Pillow, too!!! Cute mantle, Gina, and I love the mitten garland...so sweet. Great job on your smowman pillow, too. I need to check out Michaels and see what they have left. Love your winter mantle and your snowman pillow is adorable. Great job. Such a cozy mantel and cheerful. I love the white. It's so clean and fresh. Love the winter mantle! I'm going to have to make myself a "faux" mantle so I can join in the fun! The mercury glass and the icy blue is just perfect! Great winter mantel Gina. You are inspiring me to get busy and design something for my mantel.